OK, friends, as promised we would post the results of the winning entry in our promotion to give away a pair of FREE tickets to Van Halen’s performance next week at Amway Center. Of those who entered (boo…we got no fun photos or videos!) 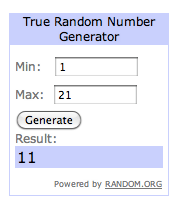 we utilized Random.org to…well, randomly select, and the winner is Karlajane! Congratulations! She is the 11th comment in the comments field (obviously if myself or Kim would’ve come up in the results we would’ve drawn again). If you’re Karlajane or know this individual, please contact us by noon this Friday (4/6) for instructions on how to redeem your tickets. If we do not hear from you by this time, we’ll select another winner. Thanks to all who participated! Hopefully we’ll have another awesome promotion like this again in the near future. We emailed you at the address provided, from pulseofcentralflorida@mail.com. Did you receive it? You can try again or send to 3lovesfarm@gmail.com I should get it either place, Thanks again.